Accommodation at Casa de Rebolfe. Casa de Rebolfe is located in Porto Antigo, overlooking a lake originated by the Carrapatelo dam, just a few hundred meters away from the river Douro. The nearest villages are Cinfaes and Baiao. The view from the house and terrace is truly delightful stretching for miles of terraced properties and woodland separated by the River Douro. Tourist boats often cruise its waters in a memorable and interesting journey. Birthplace of the Port wine, the Douro region was the first wine production region to be implemented in the world. Casa de Rebolfe was once the main house of a farm located by the river Bestanca which ceased to exist when the Carrapatelo Dam was constructed. This 18th century house is built in granite featuring careful carved stonework of the doorways, window frames and cornices. In 1990 the house was carefully restored preserving its original architecture and adapting it for tourist accommodation. Casa de Rebolfe has a total of five elegantly furnished bedrooms, all having central heating and private bathroom with hair dryer. On the upper floor there is one twin and one double bedroom, one with a view to the river. On the lower floor there is one twin and two double bedrooms. On the lower floor, in the corridor leading to the breakfast/sitting room, there is an imposing old wood press for wine making. It was used until a few years before the house's restoration. The living room on the lower floor has satellite television. From the living room guests have access to the outside terrace overlooking the river Douro and the tranquillity of the area. In the summer, the terrace is covered by vineyards providing a pleasant shade in the warmer months. There is also a living room with satellite television on the upper floor. The swimming pool is set in a gardened area approximately 60 metres from the house. It is reached by a stone path through the slopes of the property. Its dimensions are 6 by 12 metres with the maximum depth reaching 1,90 metres. In the garden there is also a barbecue area. There is a restaurant in Cinfaes which may deliver meals to the house upon request (except on Sundays). There are also a few activities such as walking tours, horse-drawn carriage tours, boat trips, fishing and the opportunity to accompany a shepherd taking cattle to the mountain. These activities have a medium level of difficulty, a duration of 3 to 5 hours and include lunch. Our visit to Portugal was one of the most enjoing voyage we have made. We were 2 couples and all of us were enchanted with this country. We stayed for 1 night in Casa de Rebolfe and since the owner couldn't be there we had the place all to ourself feeling the luckiest people in the world. This manor house is a representation of everything we loved in Portugal, it's beautiful, calm, clean, fiendly and trusting. We recomend it whole heartdly. 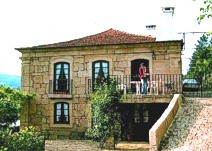 We stayed 3 nights at Casa de Rebolfe and had been a great choice in a stunning area of Portugal. The view of the house is wonderful, quiet and cosy house. Host friendly,helpfull and trusting. Beautiful surroundings. Had high expectation when booked this place and I have to say that has been fully satisfied. There is a good restaurant at walking distance. Confortable common area. I highly recomend this accomodation.